Living the life of a celebrity certainly sounds appealing if you can afford it. A chauffeur driven limo certainly allows you to arrive at your destination in style. You may even turn a few heads. Another benefit of travelling by private limo is that you can tear up your itinerary. Choose where to go and when. Your lift will always be waiting for you. And it will be the most comfortable ride you’ll ever take! Perfect for airport runs and stops around town. America is world famous for its railroad services. Whether you’re moving across the country or just taking the subway a couple of stops, the trains are easy for hopping on and off as you need. Many stations are situated in proximity to all the local amenities you may need. Of course, there are times when it’s standing room only. And heavy luggage or backpacks are difficult to manoeuvre through gates at times. Crowding and delays can be a nuisance but it’s cheap enough to make travelling on a budget workable. If you travel a lot with colleagues, family or friends, it makes sense that you all travel together. A charter bus can be the ideal way to do this. Some must-see cities can be difficult to navigate with a group in any other way. Some companies such as GOGO Charters in Seattle can take you anywhere from the city to the sights. It certainly makes sense to have a door-to-door service when it’s pouring with rain! With local knowledge, having a driver means that you experience fewer delays and some handy tips on what’s best to see and do too. In the sixties, it was easy to hop on and off internal flights as you needed. These days there are more people travelling, more flights, and much more security. Longer waits at check-in can put some people off. But the beauty of looking out of the window while you’re soaring above the clouds makes it all worthwhile for many. It’s still quicker than driving. But do you really need to be there that fast? While they may be the subject and target of many comedian’s sketches, the trusty RV is still a much-loved way to travel America. Families and retirees love the slower pace of travel and the convenience of bringing your accommodation with you. Travel in the United States can be a lot of fun. You can get anywhere at any pace to suit you. There are choices for the city, choices for seeing the landscape, and choices for comfort. How will you get where you’re going this summer? Note: To keep things legal, I will disclose that this is a sponsored guest post. However, I have tried these methods of travel and can personally recommend that you check them out too! This is from a really cool site with resources on how to travel, especially if you’re interested in moving overseas or teaching English abroad. I wrote two pieces for them, and here’s the first to be published, The Essential Travel Packing List for Moving Overseas! I write a lot for Girlz 4 Christ Magazine. I kind of have to, being the editor! I wrote several articles for the Winter 15/16 issue, including an interview with the Silver Ring Thing National Touring Team, a review of my latest favorite devotionals, a handbook for babysitting, and the secret that will have everyone forgetting about their diets as they indulge in your Christmas treats, plus a few others. For the final article in this issue, I decided to take a step back from my traditional writing and make my first-ever photo essay! I really like how it turned out. You can read all of the articles I just mentioned, plus columns from other incredible writers, by getting a free subscription to Girlz 4 Christ Magazine. Click here to visit the website and sign up! With my work with G4C Magazine, I have done quite a few interviews over the course of time with authors, actresses, and activists. And of course I’ve been interviewed too… you know, for jobs like everyone else does! But I recently had my first “real” interview. This one wasn’t for a job, it was to be published on Sisters United in Verse! I never heard of this ministry before, but they contacted me when they found out about Girlz 4 Christ. I think they did a wonderful job asking good questions that made me think! They even designed the image above, which I really like! That picture was from three years ago, when I was obsessed with pineapples, chopped off my hair for EMT training, and decided it was a wild enough style that I should dye it red, too! So maybe that wasn’t the best picture of me, but of course the part I really like is the cover collage that surrounds it. The interviewer used words I never would have used to describe myself. Talented and energetic visionary? Really? I sure hope I can live up to that! One word that wasn’t used to describe me was an adventurist. 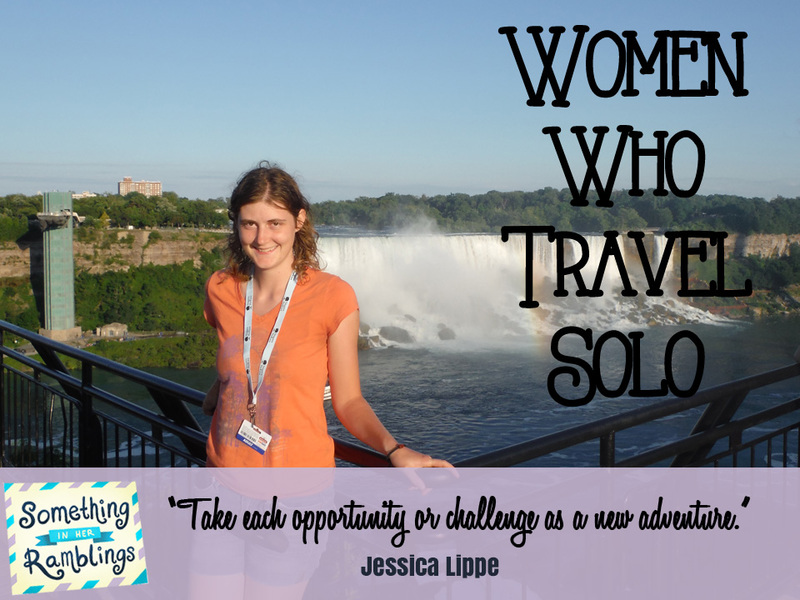 Although this interview didn’t cover any of my travel experience, it did show more of my personal, internal journey. Read the whole interview here! 1. Look at the top of this page! See that? Yes, this site is now JessicaLippe.com! To celebrate the launch of this website, I’ll have exciting things to share all next week! 2. But I won’t be sharing tomorrow, because I have an awesome trip planned where I’ll be taking a short break from the internet. Where is it? Well, you’ll just have to come back next week to find out! 3. 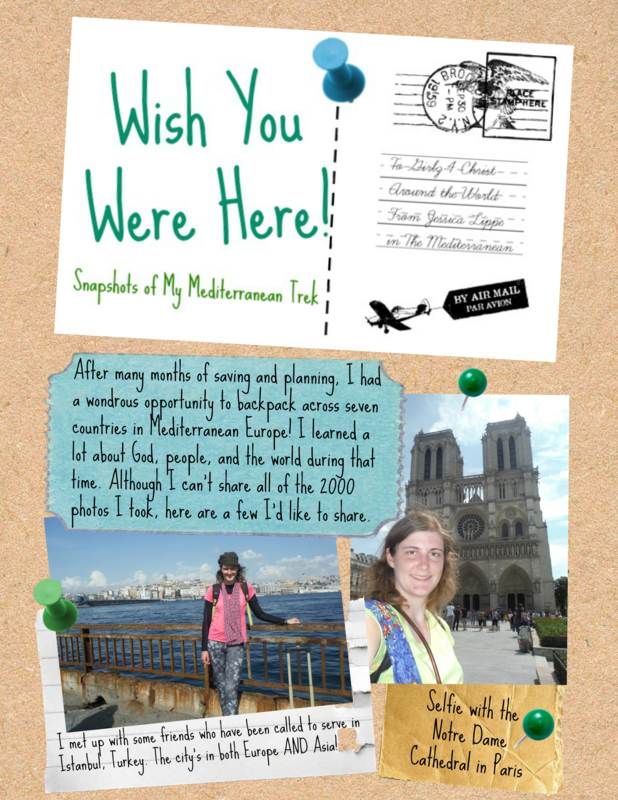 This week I am a guest writer on The Traveling Praters. Tonya Prater and I have some differences in our travel, such as she is focused on family travel while I’m more focused on single travel, but we also have a ton of similarities. At one point in time we both lived in Ohio (less than an hour apart, yet we never saw each other! 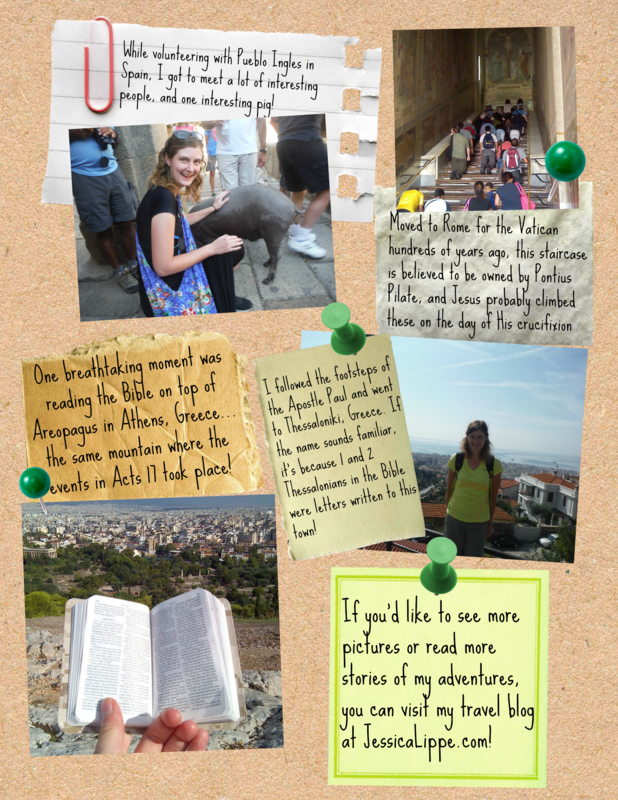 ), we’re both Christians, and we both love travel so much that we had to start a blog about it! Another difference is that I love geocaching, and Tonya has yet to try it out, so on her blog I wrote “The Joys of Geocaching”- click here to read it! 4. G4C Magazine, which I am the editor for, is experiencing a ton of growth and changes! To celebrate that, we are having a contest on its Facebook page. Click here to enter the contest! 5. Speaking of Facebook pages, this website also has one too! Please visit and like it! These are just a few of the things that I’m excited to share. I’ll wait until next week to tell you about even MORE awesome happenings!